toute leur croupe enriche de vignobles (…)’. Un bon vin vaut bien le médecin. - ‘Good wine is the best medicine’. The Forez is an ancient province of France whose location corresponds to what is today the central section of the département of Loire, but also spills over into both Puy-de-Dôme and Haute-Loire to the west and south respectively. There are two theories on the origin of its name; one is that it is corrupted from the word forêt, or forest, and was probably first used in the 10th Century, whilst the contrary view is that it takes its name from Forum Segusianorum, modern day Feurs, which was until 1441 strategically important as the prefecture town of the region. The vineyards of the Côtes du Forez are one of five wine appellatione within the département, the others being the Côte Roannaise (see separate report) to the north and the appellations of Saint-Joseph, Condrieu and Château-Grillet in the extreme south-west (which are of course on the banks of the Rhône and therefore beyond the remit of this website). The vineyards run north to south in a thin cordon on the slopes of the Monts du Forez about 20 kilometres west of the Loire. This low range of hills has been eroded in places, with perpendicular valleys transporting a series of tributaries to the Loire across the Forez plain. Following the course of the Loire from its source, this is the second plain encountered by the river. It exists as a result of the silting up of the fissure that separates the Alps from the Massif Central during the Tertiary Period. This vertical valley has long been exploited by the Loire. It is readily waterlogged and punctuated by thousands of natural ponds, or étangs, which have traditionally been used for raising carp. Otherwise the soils are poor and support only rough pasture, until one reaches the foothills of the Monts du Forez, where vineyards make way for upland meadows filled with dairy cattle and fields of potatoes and rye which are topped, beyond 1,000 metres, with forests of beech and pine. The Forez is known throughout France as Le Pays d’Astrée, in honour of Honoré d’Urfé, a notable 17th Century author whose most famous work is set on the banks of the river Lignon. The locals, known as Foréziens, speak a dialect of Occitan mixed with Auvergnat influences. The closest conurbation, to the south-east, is Saint-Étienne, an industrial town whose fortunes were built on coal, until the mines were closed in the 1970s. In the mid 15th Century Saint-Étienne was no more than a village, whose sole industry were households making ribbon. The city stands on the watershed between the Loire and the Rhône. At the town of Veauche, just to the north of Saint-Étienne, the Loire is at its furthest point east and just 50 kilometres from Lyon and the river Rhône. At less that 170 hectares, the vineyard area is tiny and almost completely unknown, even in France, which is understandable when one considers that 30% of all sales are within the Loire and Haute-Loire départements and no more that 10% is ever exported. As with many other marginal appellations, the co-operative is the major force accounting for at least seven out of every ten bottles. This in itself is an improvement; go back two decades and the co-operative was cited as the only producer in the appellation. The rather dull town of Boën has long been considered its viticultural centre, even if most of the vines have since migrated further south towards Montbrison as urbanisation has started to consume some of the (historically) best sites. At the turn of the 19th Century, Boën was a true wine capital, hosting over 100 bistrots and buvettes, drinking houses and a Forez institution. Today, apart from its excellent wine museum, there is no evidence of a wine culture within the town and no hotels or restaurants to speak of. 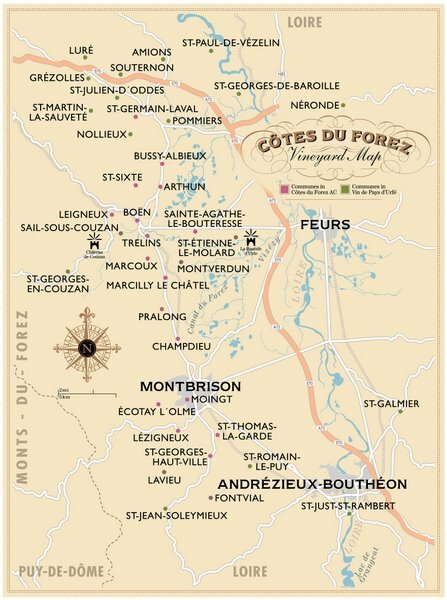 In 1998, Clive Coates MW wrote that he found the Côtes du Forez one of the least inspiring wine regions of France and that its elevation to Appellation Contrôlée status (in 2000) was completely unjustified. What is most disappointing, however, is the exclusion from the appellation of what would have historically been some of the most distinguished vineyard sites, notably the volcanic domes of Montverdun and Saint-Romain-le-Puy, which sit away from the hillside, but their south-facing slopes and basalt-rich soils offer some of the best expositions in the whole of the Forez. Whilst wine quality has undoubtably improved over the past two decades as new, independent growers established themselves, the trend has been (and continues) to see small coopérateurs grubbing up their vines as grapes no longer present a viable form of income. This partly accounts for why there has been a decline from 260 members of the Cave des Vignerons in the mid 1990s to just 65 today. For a region that relies so heavily on the success of its’ co-operative to help elevate and promote the wines of the Côtes du Forez, this cannot be good news. On a brighter note, local demand for independent grower wines is buoyant enough to ensure that most are out of stock before the new vintage becomes available, but such relative micro-production is hardly sufficient to maintain the reputation of a whole appellation. It was almost certainly the Benedictine monks allied to Cluny who established the first vines in the Forez. The oldest reference is documented in the charte du cartulaire in the Abbey of Souvigny (north of Saint-Pourçain) in 980, where it refers to vines planted at l’Annet in Boën. Less than 30 years later, the monk, Aldebertus, is attributed with planting the first vines on the slope below the priory of Saint-Romain-le-Puy after he arrived here in 1007. In the 13th Century the inhabitants of the town christened their wine Vin de Nuyts, although the style of the wine and the grape variety used remain a mystery. The vineyards were developed more extensively by the Comtes du Forez, whose feudal titles date back to the 10th Century and who also controlled Lyon and the Beaujolais. Their dynasty came to an end with the marriage, in 1371, of Anne de Forez, dauphine d’Auvergne and sole inheritor to the Forez title to Louis II de Bourbon. The town of Montbrison became the préfecture of the area since 1441 after Charles I, the 5th Duke of Bourbon, Duke of Auvergne and the Comte of Forez and Clermont, showed favourtism and transferred the title from the ancient town of Feurs on the Loire’s east bank. In 1606, Anne d’Urfé (the brother of novelist Honoré) wrote of Boën being a small town and noted that it had a lieu-dit called Courbine that produced ‘good, strong wine’. The Forez was the first region in France to be granted a railway, when in 1827 a line opened between Saint-Étienne and Andrézieux, which signaled the end for the barges that once worked the river. A second line connected to Lyon three years later. By the mid 19th Century, Boën was widely recognised for the quality of its wines, with the commune planted to capacity, with vineyards extending to 5,043 hectares. Everywhere along the slope there is evidence of the côtes’ vinous past with abandoned cabins or logis which were built by mountain communities during the 19th Century. These part-time vignerons lived high up in the hills of the Monts du Forez, but kept a few vines as part of their mixed farming existence and several times a year they would migrate down towards the plain to tend their vines, with these rudimentary maisons des vignes offering overnight shelter. During the scourge of the phylloxera epidemic the Forez was one of the last regions to be affected and provided growers with a short-lived but steady income once Beaujolais was no longer productive. 1932 – Féderation des Vins des Côtes du Forez formed under the guidance of a M. Cubaynes, arranging its first fair and exhibition the same year. The organization was disbanded at the onset of the Second World War. 23rd January 1956 – Six communes were awarded V.D.Q.S. status, therefore formally recognising the Côtes du Forez for the first time. This was extended to 21 communes seven years later. 1959 – Cave des Vignerons Foréziens, the regions only co-operative was founded, although its inaugural harvest was only in 1962. 25th February 2000 – The Côtes du Forez is upgraded to full AC status. As already mentioned, the majority of the vineyards run between the towns of Boën and Montbrison in a thin cordon along the eastern flank of the Monts du Forez at between 390 and 560 metres. It is said that many of the best sites have been lost since the end of the 19th Century by encroaching urbanization. The vines are mostly sited on gentle east or south-east facing slopes, making the Côtes du Forez appear like a natural extension of the Côte Roannaise to the north. The absence of any real Mediterranean influence means that ripening is later than in the Beaujolais, where obvious comparisons can be drawn. Cool, even in summer, the vineyards are protected from Westerly weather conditions by the rain shadow created by the Massif Central. The Côtes du Forez is distinguished in having some of the oldest volcanoes in France and evidence of their activity can be seen throughout the region, but it is granite that is the most prevalent soil type, running in a continuous line down the foothills of the côte. Granite du Forez – The generic soil of the region with granite covered with sand or in some places clay or clay-limestone. Its strength is that it warms up quickly in spring encouraging the vine out of its winter dormancy, but is also very free draining which can lead to water stress, especially to those vineyards planted on slopes. The resulting wines are generally light, fruity and for early drinking. Migmatites du Montbrionnais – Granite covered in sand and clay mixed with migmatite (mixed igneous and metatmorphic rock) which is well aerated and allows vine roots to easily penetrate the soil. The clay helps to retain moisture, so is less susceptible to water stress in years of drought, ensuring vines here can be harvested a little later. It extends to around 25 hectares of the current plantings in the Côtes du Forez and is also responsible for producing lighter styles of wine. Basalt – Very localised, these parcels of volcanic rock are the basis for the various pics, small volcanic domes that can be seen as outcrops along the main slopes, most notably at Marcilly-le-Châtel, but also extend onto the Forez plain (at Montverdun and Saint Romain-le-Puy for example). Their basalt soils are low in silica, but rich in iron and magnesium and also have the added benefit of retaining moisture which helps reduce the risk of water stress in times of drought. These are considered the best, if rarest sites, producing more concentrated and age worthy Gamays that are certainly capable of displaying their specific terroir in better vintages. There are 17 communes within the Côtes du Forez appellation, covering some 160 hectares of vineyards. In addition, there is a derogation in place for the communes of Boisset-Saint-Priest and Sail-sous-Couzan to allow producers based there to vinify and raise the wine within the appellation. One commune, Débats Riviere-d’Orpra situated to the north of Boën, was included in the original V.D.Q.S. décret of 1956, but was excluded when the region was upgraded to full A.C status in 2000. It is also worth noting that since the appellation laws and boundaries were drawn up in the late 1990s, there have been several sites that have been re-established but which fall outside of the delimited area. For example, slopes on the Pics of Montverdun and Saint-Romain-le-Puy offer some of the most distinguished vineyard sites in the whole of the region. Originally inhabited by monks who looked to establish places of worship on their summits, these sites would have also been selected for their suitability for the vine. Prior to the mid to late 1990s, both these sites were abandoned and lost to viticulture, but have since been given a new lease of life by independent vignerons Verdier-Logel and Stéphane Réal, who have also taken advantage of not being bound by legislation and planted these slopes to none-traditional varieties. For the moment these distinguished sites have to be content with Vin de Pays d’Urfé status. Gamay remains the only permitted variety for the appellation, although demand on local growers to produce white wines as well as red and rosé has ensured that some have now planted Chardonnay whilst others have opted for Viognier, Roussanne, Pinot Gris and Syrah, although any variation on the Gamay theme are necessarily declassified to Vin de Pays d’Urfé. One grower, Jean-Luc Gaumont, has also planted a little experimental Pinot Noir, whilst another Daniel Mondon has made it is mission to give some long forgotten old vine hybrid varieties a second lease of life, albeit as Vin de Table wines (see his Grower Profile for more details). Most of the older plantings are attributed to a local variant known as Gamay Saint-Romain (occasionally referred to as Gamay de Saint-Galmier). It takes its name from the village of Saint-Romain-la-Motte, located on the Roanne plain and said to be the source of the nursery that supplied the growers with their original stock when the vines were re-established in the early 1900s. Gamay Saint-Romain was originally selected for its vigorous capabilities, and said to be four times more productive than Pinot Noir (yields of up to 100hl/ha were common in the late 19th Century). It enjoys its position on granite and volcanic soils, although can suffer heat and water stress in years of drought. It is sensitive to early spring frosts and easily aborts at flowering if the conditions are too windy during the critical months of May and June. It is also prone to eudemis (moths), mildew, grey rot and oidium. The bunches are large and compact, with thick skinned oval berries with white juice. At least one grower (in the Roannaise) considers it capable of only ‘low quality’ wines, devoid of sugar but exhibiting high acidity. Regardless of this, Gamay Saint-Romain remains the most widely used variety in both the Côtes du Forez and Côte Roannaise. Newer plantings, however, are invariably of clones developed for planting in Beaujolais and grafted onto 3309 rootstock. Also within the Forez there are, like most places where Gamay is grown, some rogue Teinturier vines. Here, they are made up of Gamay Bouze and the pink fleshed Gamay de Chaudenay (aka Plant Rouge de Chaudenay, Teinturier de Chaudenay, Plant Gris and Gamay Six Pièces), a semi-teinturier which is believed to be a mutation of Gamay Bouze. Teinturiers are outlawed within the Côtes du Forez appellation, although any isolated parcels that remain can still be utilized within blends of Vin de Pays d’Urfé - to a maximum of 30%, although in reality plantings in the Forez must be account for a fraction of one percent. There are four permitted methods of pruning: Guyot simple (with a maximum of ten eyes), courtes en gobelet (11 eyes) which is applicable for older vines and now becoming increasingly rare, cordon simple (11 eyes) and cordon double (11 eyes). The minimum density specified under the appellation laws is for 4,000 vines per hectare (vph), to a maximum of 2.5 metres between the row and 0.80 metres within the row. Where ease of mechanization is the primary consideration for planting, then most vignerons work on 4,500 vph. Old vineyards were historically planted to 9,000 vines per hectare and Gobelet trained. The Côtes du Forez appellation allows for both red and rosé production and as one would expect from any region producing wines from Gamay the style is more for Vins friands, light, fresh and juicy examples that are essentially designed for consumption within a couple of years. The red wines are mostly produced by semi-carbonic maceration using whole clusters (see below), although some growers do use more traditional vinification methods, especially when their vines are situated on volcanic soils, which provide grapes that are potentially richer in tannin and therefore more corsé. Maceration carbonique or Maceration semi-carbonic - a technique widely attributed to the production of Beaujolais - is common here. This generally involves a week long fermentation and maceration in a closed tank, whilst temperatures are allowed to rise to around 30˚centigrade. First seen in Beaujolais in the early 1990s, this method was soon common place in the Roannaise and has also filtered down into the Côtes du Forez. The process involves heating either whole berries (or must) to a temperature of between 50 and 80 degrees centigrade for around one minute. This ensures the skins of the grapes are hot, whilst the pulp remains cold. The result is that the skin cells of the grape are broken down, releasing the anthocyanins (colour compounds) during maceration and fermentation. The result, in theory, is to produce wines that are rich in colour, with low levels of astringency (the method extracts only the anthocyanins and not the tannin compounds) and increased primary fruit flavours. Rosé wines account for around 20% of production and can be made by maceration, saignée or pressurage direct. Most are consumed within a year of the vintage. The appellation rules state they must be dry (the décret for the Côtes du Forez appellation states less than 3g/l residual sugar), although many growers choose to make two separate versions; one that conforms to the appellation and a second which leaves residual sugar and is therefore declassified to Vin de Pays d’Urfé status where no such restrictions apply. Residual sugar levels in these wines can be as high as 30-plus grammes per litre. Whilst 20% might seem a healthy amount of the total crop, this has to be seen in light of changes in fashion (the growers appear to have no problem moving copious amounts), but also in light of their desire to bleed off juice to help concentrate the red wines. In an attempt to find new markets for the production, some growers in the Côtes du Forez and the Roannaise have started to make a sparkling wine using Gamay. They are produced using Méthode Ancestral and are intended for almost immediate consumption. The wine analysis between the different producers ranges greatly, from between 6.5% to 9.5% alcohol, whilst residual sugar levels can be anything between 3g/l and 60g/l. Hail, especially around Marcilly-le-Châtel, in mid July reduced an otherwise healthy crop down to around 35hl/ha. The harvest started around the 15th September in perfect conditions. Vineyards on granite soils were beginning to suffer from the effects of water stress. Berries were small with thick skins with good levels of ripeness. The resulting wines are good and concentrated, with those grown on volcanic soils very clearly defined. This is certainly the best vintage since 2005. A small harvest due to less favourable conditions during flowering and a dry summer which created some problems of water stress. This is an ordinary vintage for the appellation, with the wines lacking the structure and tannins to ensure a long life. It was a very good year for the Vin de Pays white wines. A modest vintage in every respect. Ask any vigneron what is the best vintage for the past generation and all, without question, cite 2005.